The children from the future reminisce about the fond memories they had at the Watchtower when they were younger. Cyborg informs them that he is going to scan their DNA to see if there is any validity to the claim that they are indeed their offspring from the future. Indeed it is as they claim to be. Flash and Jessica Cruz gave birth to 3 of the children. Wonder Woman gave birth to one but then abandoned him, because he was a male child. Superman brought this baby into his family with Jon and Lois and tried to raise him as his own. Cyborg is the father of another and so is Mera. It is here where it gets a tad interesting. Hunter tells Superman that he enjoyed hanging around Jon and Damien but that was before. "Doesn't matter", he says. Feeling left out Baz asks, "So, I had no children?" And is informed that he ends up leading the Yellow Lanterns after he kills Sinestro. 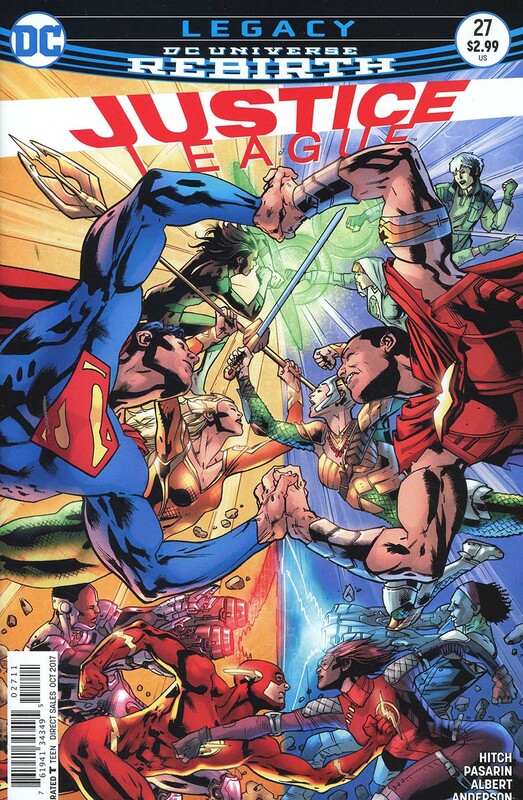 The League asks them why they're here and Cube links with Cyborg and shows him everything, from the birth of these offspring, a Super Powered war between meta heroes and meta villains, the children's seclusion on Mount Olympus, to which they were abandoned there, the rise of Sovereign and his rise to ruler of Earth, and finally the kids' jump to our time. Batman is in the cave analyzing data on the Kindred when he gets a warning someone is in the cave with him. It's Arthur Curry from the future who gets the surprise jump on Batman and standing over him, tells him he needs to borrow some of his stuff. Next: The Secret of Hunter Prince. Story - 4: A decent story, but a very fast read. The war of the Meta's sounds interesting and I would love to see that explored in the near future. The one question I keep asking myself is where did these children come from, our future? A different multiverse future? So many possibilities and I fear we the reader will never get an answer. A good portion of the book read like a Maurey Povitch show, "Jessica Cruise and Barry Allen, the tests are in, and you ARE the father." But even through all that a couple more mysteries opened, Baz kills Sinestro? Wonder Woman turned her back on her own child? And what did Jon and Damien do to ruin Clark's family? By the title of the next issue it appears we will get a little more information on Hunter. Must admit I am looking forward to next issue. Art - 4: Another solid performance by Fernando Pasarin, I really enjoyed this issue a lot, and the Flashback scenes looked incredible. I also like the designs of the children. This is an Alternate Earth series just waiting to happen. 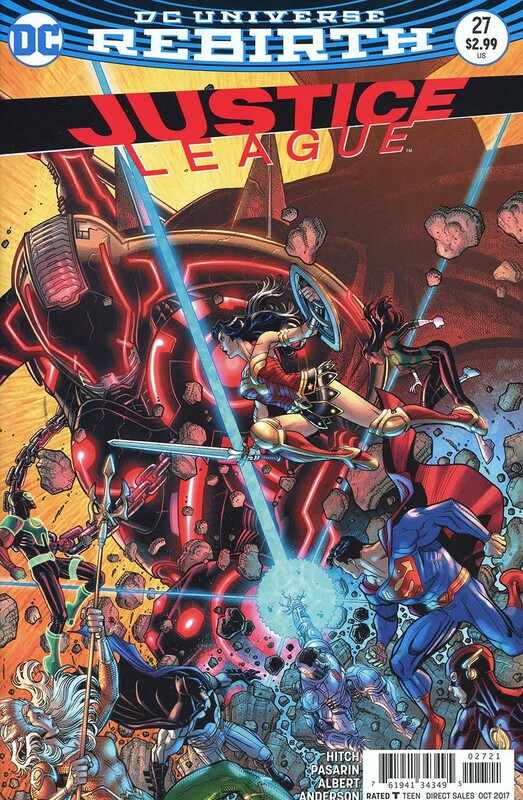 Cover Art - 4: This cover reminds of the classic vs covers from back in the day where the Justice League would be on one side and maybe the JSA was on the other. But this time it was parents vs children. Final thought: I like where this story is going, the pace seems perfect, the threat is major and the kids add an interesting twist. This is Bryan Hitch's last arc on the title and after a real shaky series to date, he seems to be absolutely nailing his final series. If you had given up on this book in the past, take a relook at this storyline, you might be surprised.